My sister, Jolanda, and I grew up in a typical Dutch family. In 1996, Jolanda was 27, active and fit. She seemed to have it all: a loving husband, a home of their own, two cars, a big dog,a job she liked, and she was pregnant with their first child. It was a boy. I was looking forward to becoming an aunt. Six months into her pregnancy, Jolanda fell ill. She was short of breath, extremely tired and was turned off by food. The midwife explained that my nephew-to-be had grown so much that he pressed against her lungs and that there was nothing to be worried about. It sounded logical, but it turned out to be wrong information. She was home alone for the weekend because her husband was abroad for work. My parents stopped by and were very worried about the way Jolanda looked. My mum called the midwife and Jolanda’s GP who said my mother was overly concerned. So they took my sister home with them. She seemed to be doing a little better in their care, but Monday morning Jolanda was rushed to the hospital. The x-ray showed her heart was enormously enlarged; the doctors were doing everything they knew and she seemed to improve. The call came in the middle of the night. Jolanda had had an attack of some kind. When we arrived at the ICU, she looked strange and swollen; she was so cold. Her doctor said her organs where failing. I asked him if he could take some of mine and make her chances better, but he said no. It was hopeless. The doctors had tried everything, but did not know what was killing her. 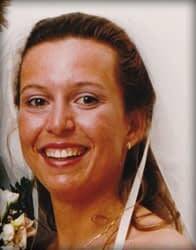 Jolanda and her unborn child died at half past five pm on December 3rd 1996. On autopsy, giant cell myocarditis was found. The doctors had never thought of that diagnosis because it is so rare and had never been seen in a pregnant woman. Her cardiologist showed us a thick book about heart diseases; he called it “the bible of the heart.” It only had a few lines on the disease that killed my sister. I cannot help him with his research, but I realized I can do something. I’ll be running the NYC marathon this year. I intend to raise as much money as I can for myocarditis research to help Dr Cooper and The Myocarditis Foundation find the answers to the “why-question” and hopefully save many lives. I too hope that Dr. Cooper and the Myocarditis Foundation are able to answer the “why” question someday. It’s so terrible that there are still such deadly illnesses out there that we know so little about.